Muir took the baton from James West in second place, just behind training partner Jemma Reekie who was running for the Scotland A line-up. But the British captain put her foot to the floor and produced a dominant performance to secure the Stewart trophy for her country. It was the perfect end to a perfect week for the 23-year-old, whose obliteration of Liz McColgan’s 25-year-old British indoor 5000m record in Glasgow in midweek showed that a pre-Christmas winter training stint in South Africa has paid dividends. She will board a flight headed back there on Tuesday for another training camp in the best of spirits. “I had to bring it home for the team,” said Muir, who anchored a line-up which included James Bowness, Charlene Thomas and West. “Jemma and I have been training hard together so I know she’s strong and I had to put the bit in from the start but I just wanted to run as hard as I could. I’m fortunate that I’ve won the relay every time I’ve done it and I just want come home with the win again today. As captain as well I thought I’d do my duties for the team. There was an impressive climax to the race. Scotland A had taken an early lead through Jake Wightman but it was Bowness who led the way for Britain at the first changeover. Thomas ran a controlled second lap but it was the USA, through Lianne Farber, who led going into the third lap. American Will Leer had looked strong before West and Ireland’s Kieran Kelly began to push. Scotland A’s Neil Gourley then put in a burst to surprise everyone and hit the front for Scotland A to give Reekie that advantage over the final lap. Muir, however, would have the final say. Scotland A finished third, behind USA. In the senior women’s race, as with the European Cross Country Championships, Yasemin Can dominated from start to finish over the 6km route. The difference with Sardinia was that, on this occasion, she was not followed immediately home by Meryem Akda. This time the two Kenyan-born athletes, who now compete for Turkey, were split by an impressive performance from their European team captain Fionnuala McCormack. 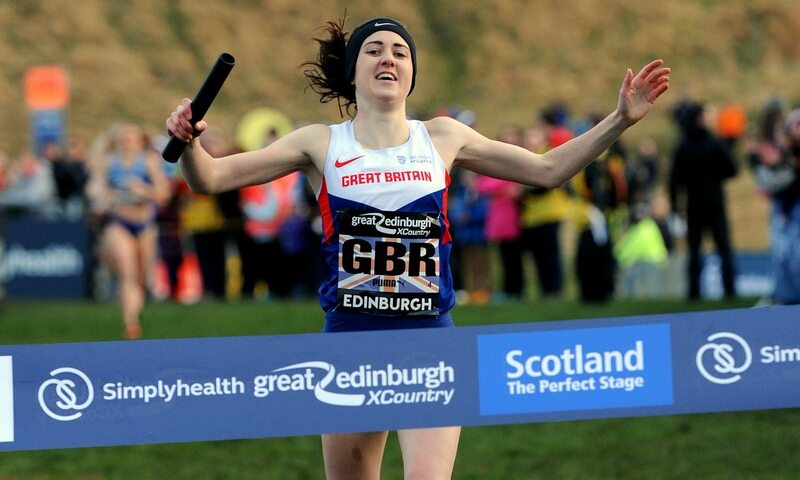 The Irishwoman had been left disappointed by her performance in finishing fifth at the European Cross but, with Can having established a commanding lead in Edinburgh which meant the outcome never looked in doubt, McCormack reeled Akda in over the closing stages of the four-lap race to finish second. Charlotte Arter was first home for the British line-up, in seventh place. There was another dominant performance in the junior women’s race – which came from Great Britain’s Harriet Knowles-Jones. The European junior cross country bronze medallist looked thoroughly assured over the 4km route, seeing off a stern challenge from the USA team. Coming through the opening short lap, Knowles-Jones found herself tucked in behind the blanket coverage provided by America’s Alicia Monson, Taylor Werner and Nevada Mareno. Monson and Knowles-Jones began to move away, before the Briton opened up a commanding lead and never looked back from that point on. Expectation follows Alex Yee whenever he races these days and the Briton made what looked like a very confident start to the defence of his junior men’s title. He had led all the way through the first lap but, suffering the effects of heavy a cold, was sucked back into the pack. America’s Finn Gessner took over with Britain’s Scott Beattie in close attendance. The race was wide open going through the halfway stage of the 6km distance and it was USA’s Noah Affolder who took control, seeing off Europe’s Miguel Gonzalez and compatriot Conor Lundy. Beattie was first Briton home in 8th. Noah Affolder of USA wins junior men’s race. Senior men’s race action saw Callum Hawkins pipped by USA’s Leonard Korir in a thrilling race, while Mo Farah placed seventh. Our full online report can be found here.